The Kaweah River is located in the foothills of the southern Sierra Nevada Range of California along Highway 198 at the southern entrance to Sequoia National Park. 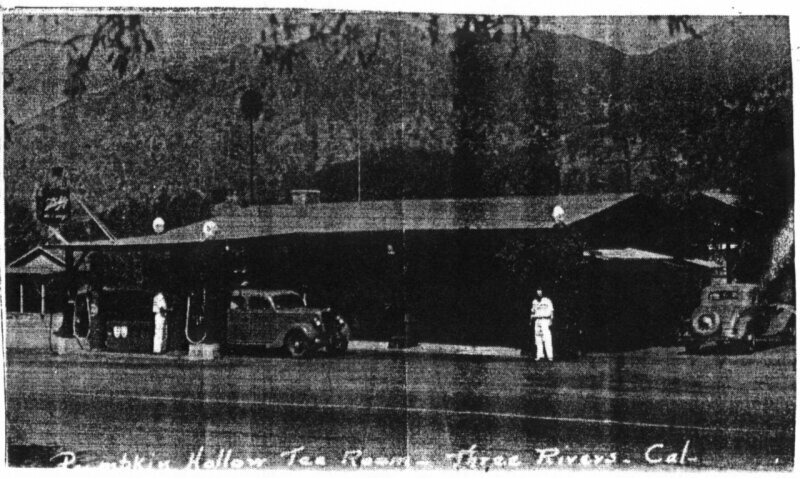 The river passes through the small town of Three Rivers and ends up in Lake Kaweah (Terminus Reservoir). 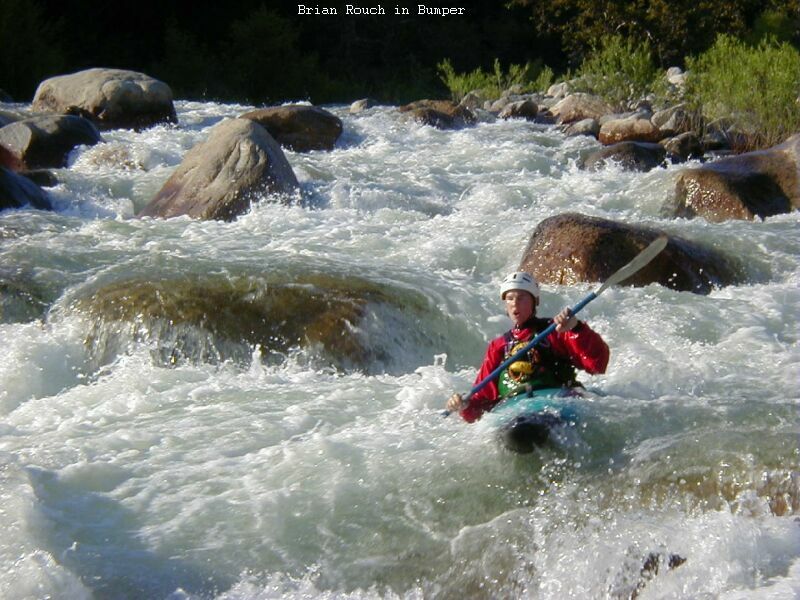 It's one of the shortest drainages in the US from its headwaters at 12000 feet to Lake Kaweah. 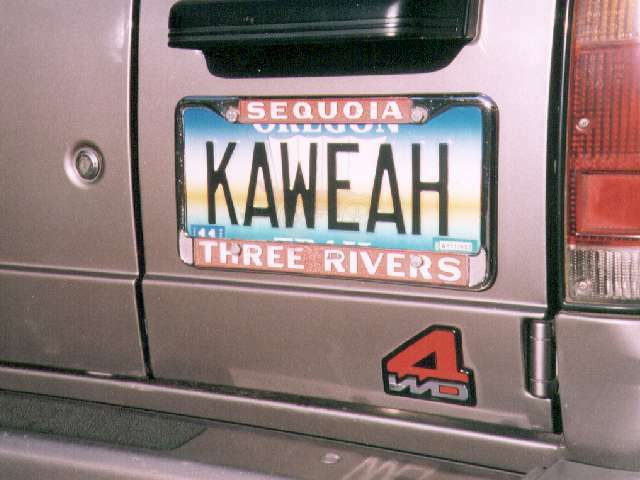 The Kaweah River, like its neighbors the Kings, Tule and Kern, never sees the Pacific Ocean. Instead, it splits into many channels upon entering the San Joaquin Valley below Lake Kaweah and is mostly consumed by irrigation. What's left, if any, ends up in Tulare Lake. 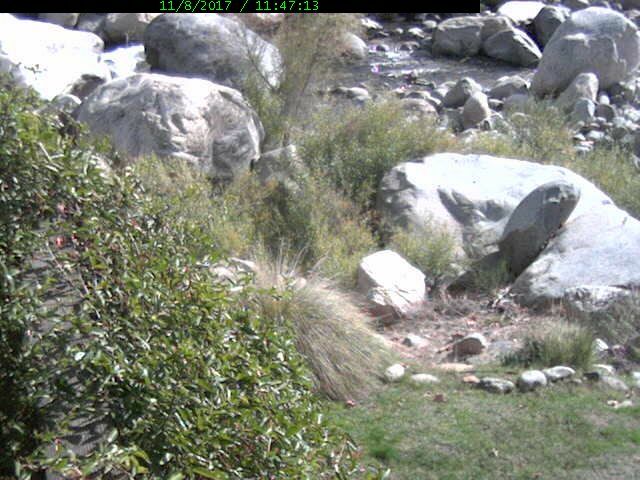 The Kaweah Rivergauge at Pumpkin Hollow Also available as http://rivergauge.kaweahriver.org is not currently reporting. 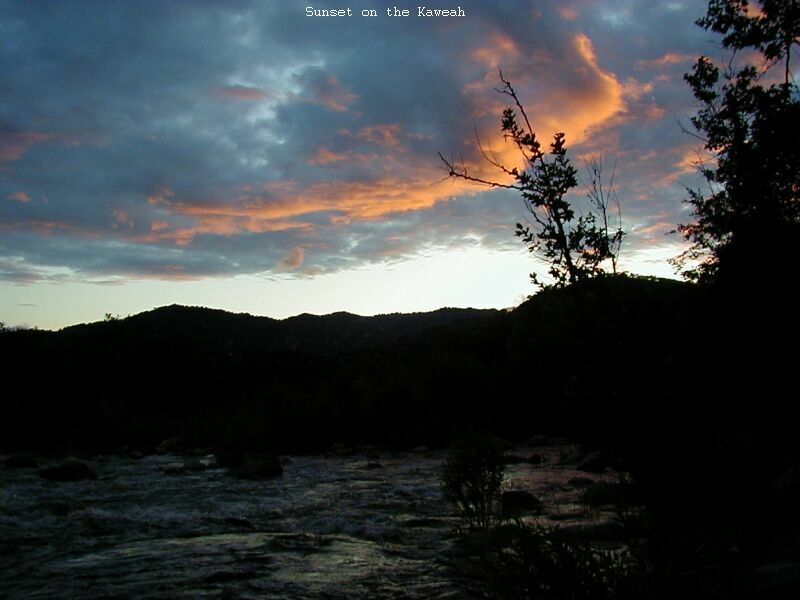 Local weatherstation CW4177 is operated by the Kaweah River Page since 2005. Try all the below links to see what you like best. CWOP site will always be most current as that is where the raw data is uploaded. Other sites get their data from CWOP time delayed. Station TSHC1 Ash Mtn. 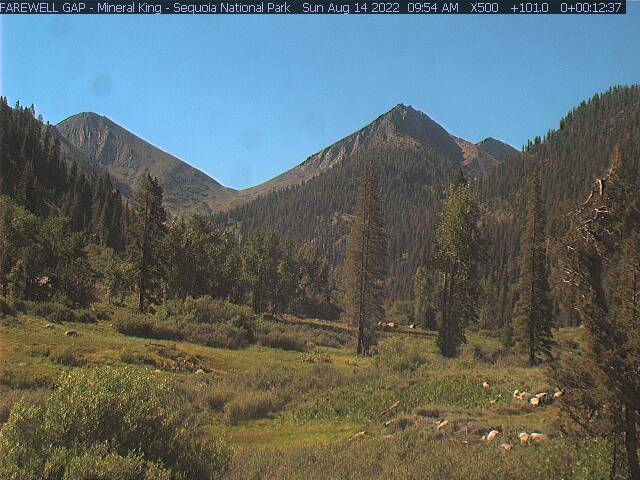 Park Headquarters - 1730 ft.
Station CQ161 Giant Forest - 6234 ft.
Station AT846 Lodgepole - 6690 ft.
Station CSWC1 Case Mountain - 6450 ft.
Station WVTC1 East Fork Kaweah near Redwood Creek - 5240 ft. Your browser needs to support iframes to see anything. If you see only a black rectangle above then you need an updated modern browser. The Time Lapse is likely a temporary offering for this flood event only. Enjoy! Message of the Day has been added on Oct 25, 2005 to allow the webmaster to post this message remotely from any computer with internet access. The message is displayed as a GIF image in keeping with the fact that the KRP is a static web page, i.e. it is not generated on the fly. The message image is updated every 15 minutes. Automatic daily twitter updates each morning with the 3AM COE flow at Three Rivers, lake level, and lake level below spillway. Other noteworthy tweets from time to time. 03-21-2017 The Message of the Day has replaced the Boater News section for the most part becuase it is easier to update. Probably about time to move some the below news into the News Archive. 03-21-2017 The webcam that was watching the river from Feb 7th until Feb 20th has been removed. It may or may not get permanently installed in the future. 04-23-16 The MesoWest weather links that used to go to the ROMAN server now go to MesoWest itself. The ROMAN server is going down on April 27, 2016 due to lack of funding. The data is the same but formatting was a little better on the ROMAN server. 02-09-15 The California drought continues statewide even worse than last year. The drought can be tracked at the California Drought Monitor Page . 04-16-14 The 30 runoff forecast graph is posted below in the Spring Runoff section. The do-it-yourself CNRFC Modeling Page is where you can create a variety of custom models. 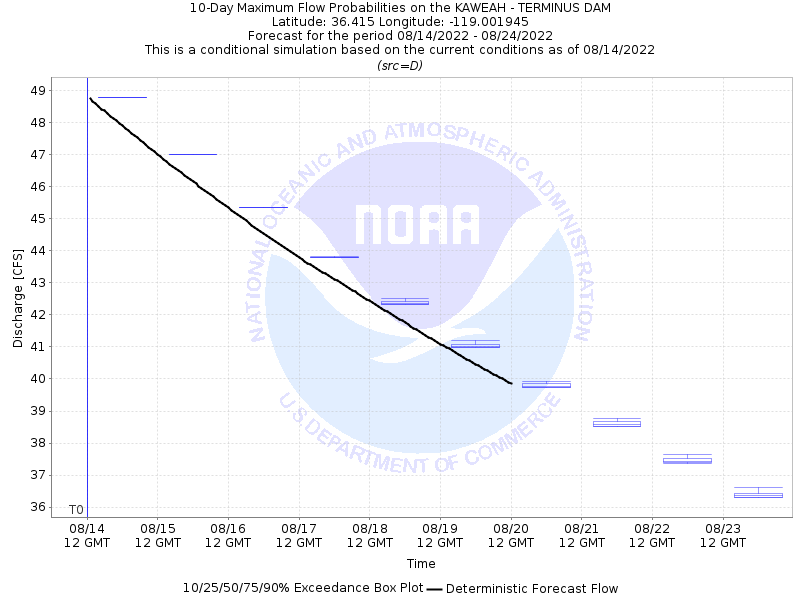 The page was used to create the 30 day flow forecast graph on this page. 05-15-13 5PM. 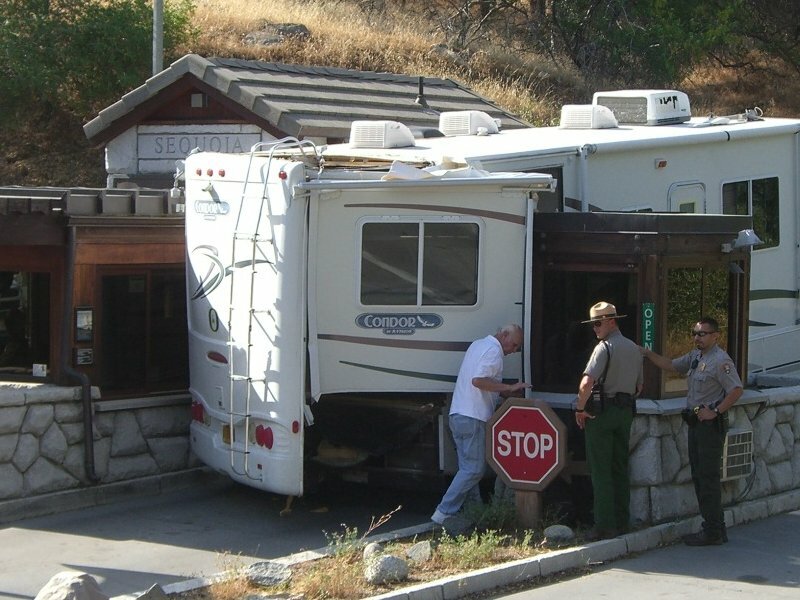 The KRP breaks the story of the Wedged RV at the park entrance. Looks like it had the expanding bedroom partially deployed when it got wedged between the two entrance booths. The RV was taken away by towtruck and looked pretty trashed in the rear. 03-15-13 There is a new East Fork River Gauge 90 yards above the Pumpkin Hollow Bridge at the confluence of the Middle Fork easily visible from the bridge. We are calling the bottom major mark 2.0 feet. Major markings are at half foot intervals and the gauge spans a range of 2 feet. 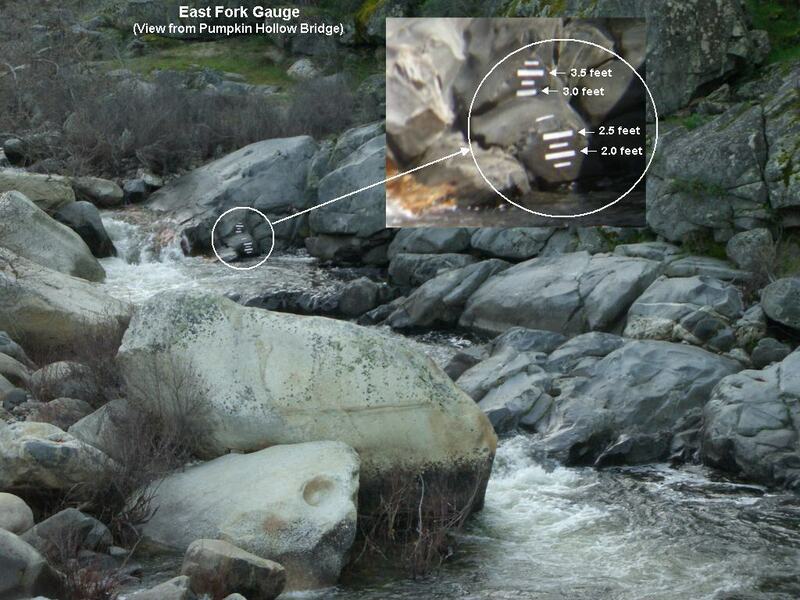 The East Fork should be runable at low flow when the level reaches the lowest minor mark at 1.75 feet. 07-03-12 Here are the links to the first descent of the Marble Falls Gorge. 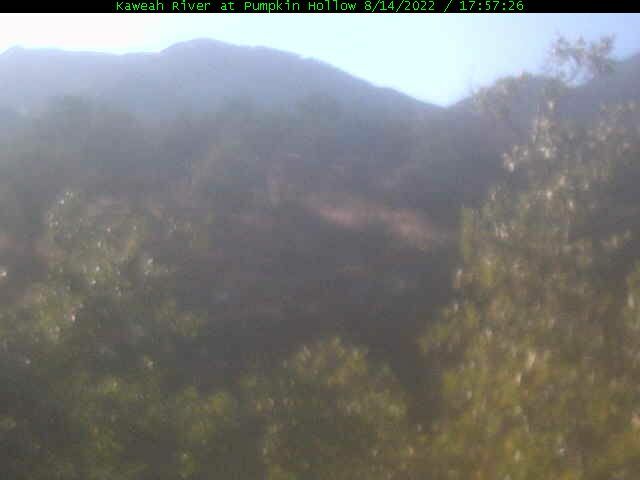 05-05-12 The May 1st snowpack report has the Kaweah drainage at 35% of May 1st average and 27% of April 1st average. The Kern River basin to the south is a dismal 5% of May 1st average and 7% of April 1st average. The Kings River to the north is 14% of May 1st average and 11% of April 1st average. 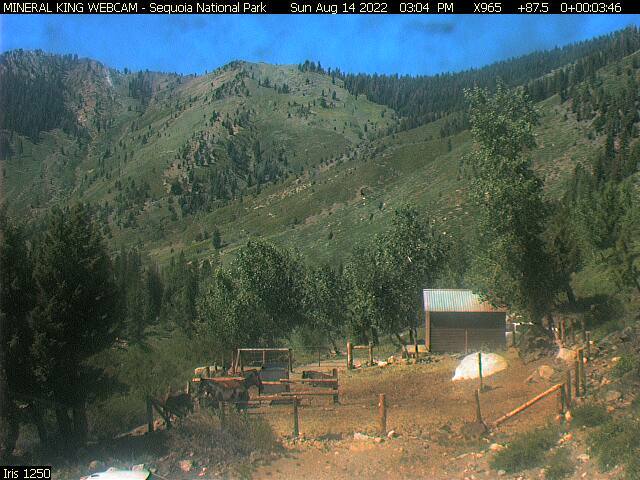 The Kaweah snowpack is the best of the Southern Sierra. 05-01-12 The peak flow for the 2012 runoff season occurred Friday morning, April 27. The net 24 hour average inflow to the lake peaked Friday morning at 2710 cfs. While not caused by normal temperature fed runoff conditions, the rain peaked the river to a point that even future hot weather can not surpass. The non rain normal runoff peak occurred on April 23rd. 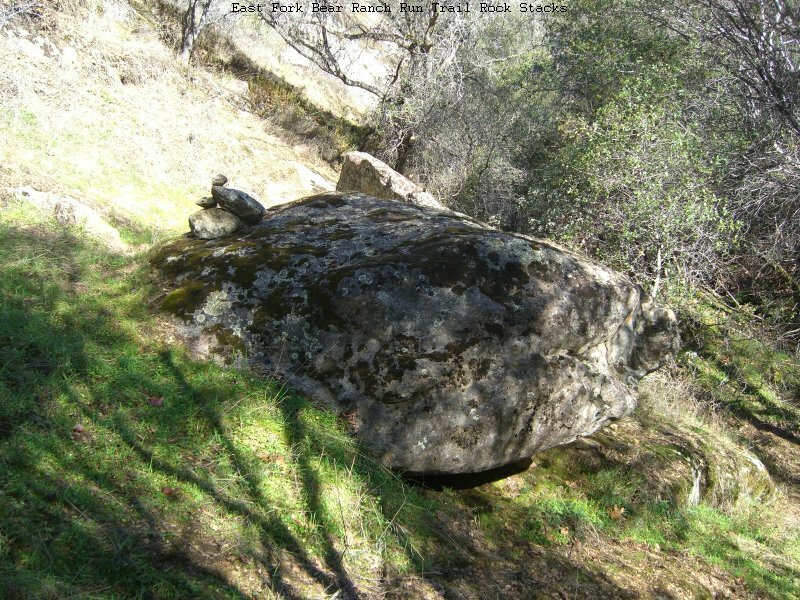 04-07-12 There was a pretty serious pin on The East Fork Bear Ranch Run Sunday, March 31. It involved one of the young locals being pinned crosswise to the current, boat fully submerged, nose left, and cockput facing upstream in a fast moving slot of less than a boatlength in width. Rescue was immediate and successful do to safety set up prior to the mishap.After 4 trips in to work on dislodging the boat and one broken comealong, the boat dislodged itself and was later found downstream. Appearing at first to be totally trashed, thanks to a little warm sun, a hair dryer, a hammer, and a little time, the boat is back in service nearly as good as new. One tough cookie. "It take's a lickin' and keeps on tickin' ". 04-05-12 The April 1st snowpack report was completed with 4 of the 5 stations surveyed. The Farewell Gap data was not obtained due to the risky conditions getting to the survey location. The Kaweah basin is at 50% of average. The snowpack graph for the Southern Sierra further down this page shows the season progress and how the snowpack hovers barely above the dry year of 76-77. Recent April precipitation is helping a bunch. 02-10-12 A new Trail has been built to access the East Fork of the Kaweah slightly above mile River Mile 2.0 above the Middle Fork confluence. 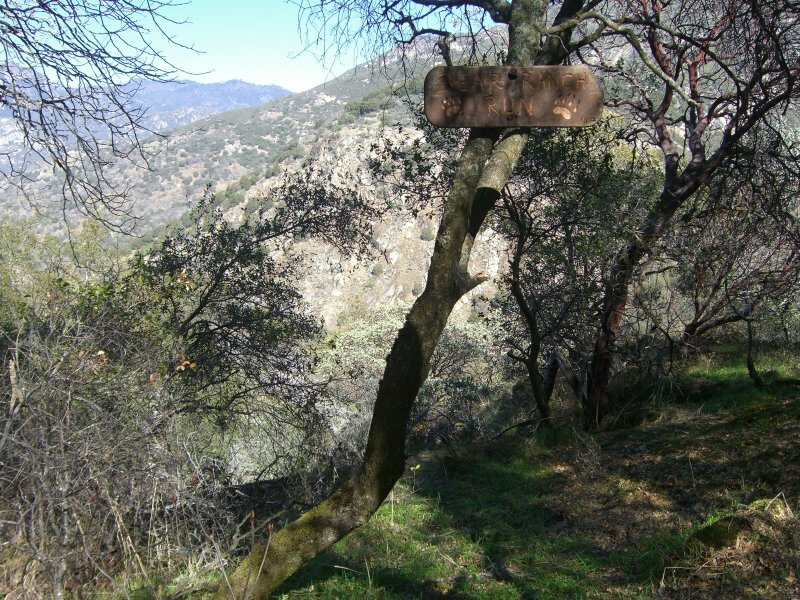 The trail opens up the lower half of the East Fork to those not up too the task of running the more difficult upper section from the Oak Grove or Helipad Put Ins. It also allows for a lower overhead run that could be done in a couple hours in an afternoon. The trail is all on public land and ends at the river 1/4 mile or so above the point where the old Mineral King wagon road meets the river on private land. The run will be called the Bear Ranch Run. 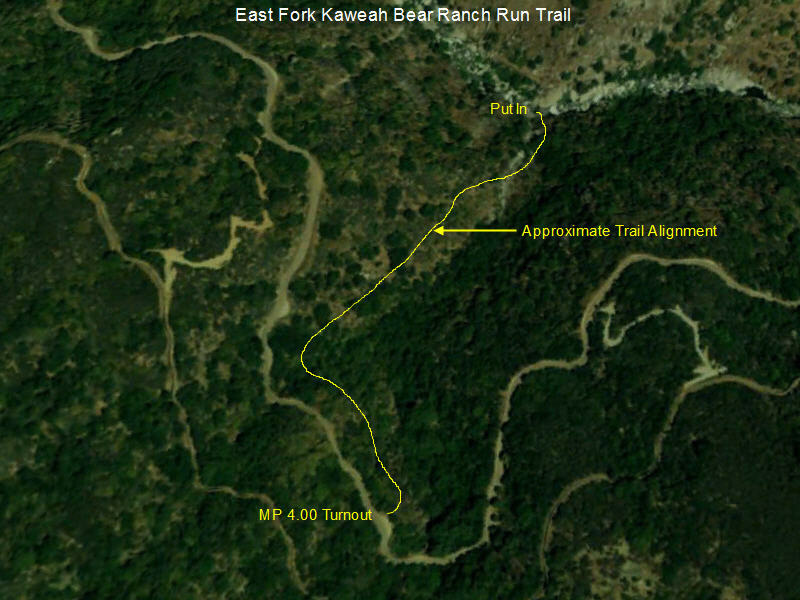 The Bear Ranch Run will be 0.9 miles shorter than the run from the Helipad put in avoids some difficult portages including the dreaded portage at Dead Mans Alley. While easier than the upper half of the East Fork run it is still a Class V run with a couple of portages depending on your condition. The trail takes off at a large turnout at MTN 375 Milepost 4.00 on Mineral King Road where plenty of parking is available. 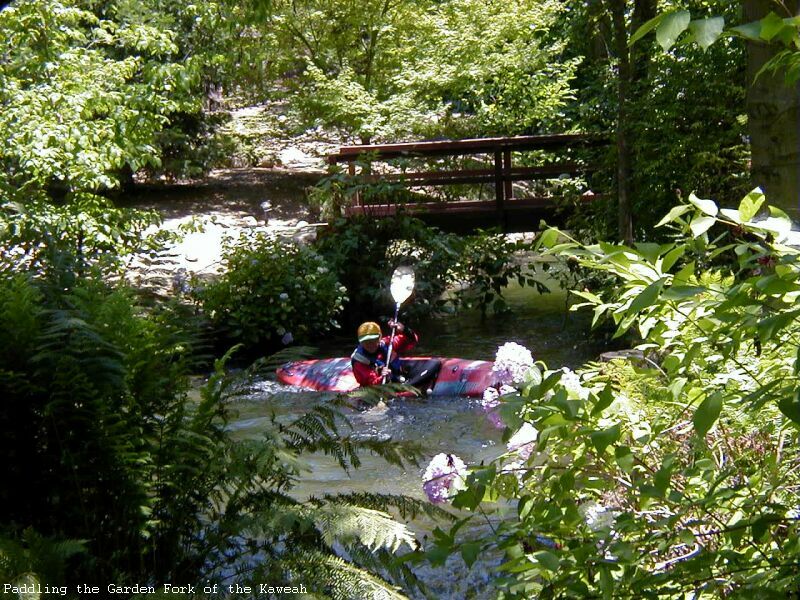 The 0.35 mile trail drops 500 vertical feet to the river and is easy to follow. Plan on about 30 minutes to get to the river. Just follow the most open path. After 100 feet or so you will see the Bear Ranch Run Trailsign on a tree. As you decend the trail you will occationally see Rock Stacks marking the trail location. Further down the trail Crosses the Creek Drainage from it's west bank to the right bank. The last 30 vertical feet is steeper and is aided by a permanent Fixed Rope tied to a tree. At the bottom of the rope you arrive at the Put In where nice granite bedrock makes for an easy putin and/or ferry across to hike up and run the falls just upstream. Here is the View Downstream from the put in. There are no stands of poison oak but there are surely a few isolated stalks of the nasty plant in or adjacent the trail. A bit more clearing work is needed in the bottom third as of this writing. Boater News prior to January 2012 has been moved to the News Archive . There is a bunch of good stuff in the archive going all the way back to 2000. 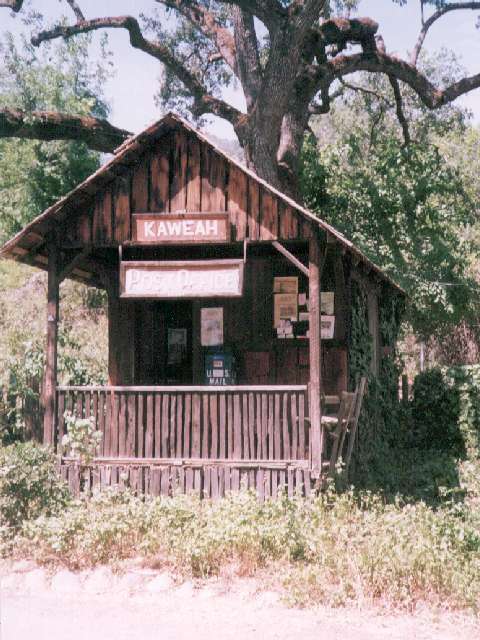 The News Archive represents a pretty good historical timeline of the Kaweah for a decade. 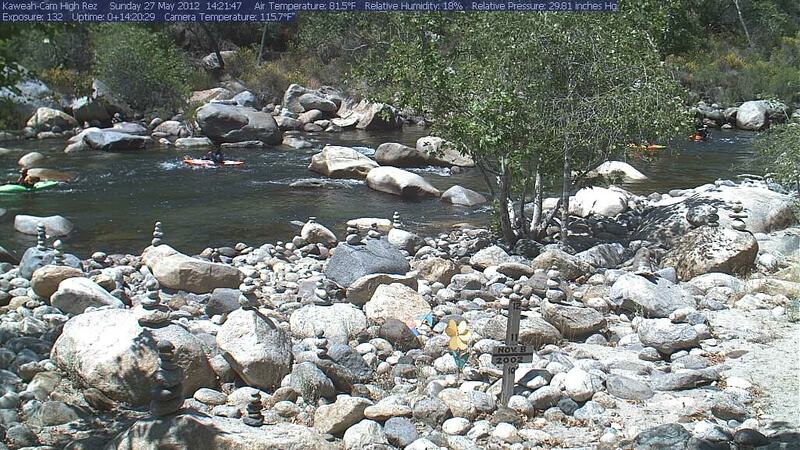 Middle Fork Kaweah at Buckeye Tree Lodge below No. 11 on the Park Boundary section. The current hours of operation for all webcams are 5:30AM through 8:30PM Pacific Time. Middle Fork Upstream View and Downstream View at Portage No. 11 on the Park Boundary section from the Buckeye Tree Lodge. 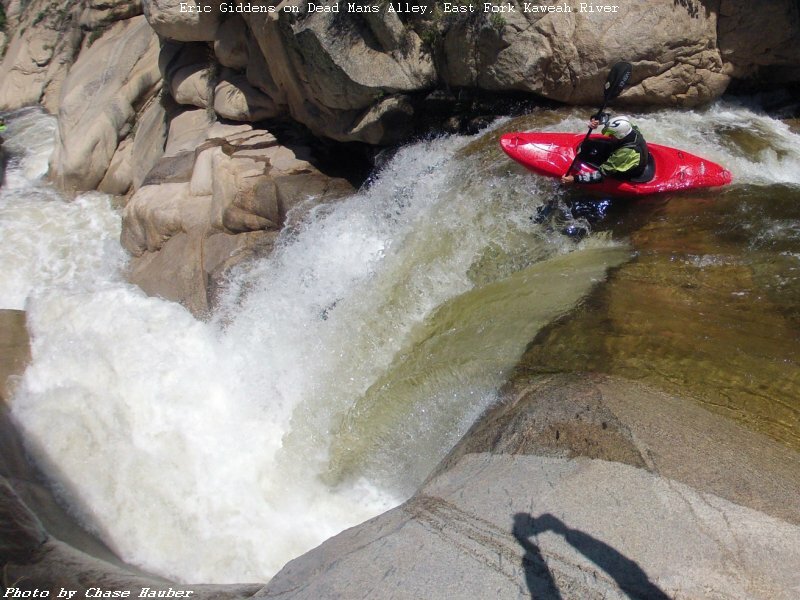 Kaweah River Picture of the Day Eric Giddens on Dead Mans Alley on The East Fork! (link launches in new browser window) Turn off your popup blocker if this link fails to work! 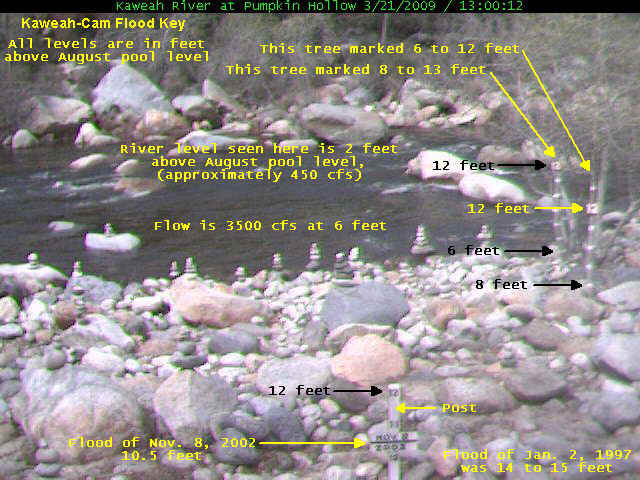 The Kaweah River Picture Page Also available as http://pictures.kaweahriver.org All the pictures from the 2000 through 2006 seasons. The Picture Page is served by a separate server with always on connection, very fast upload speed of 5Mb/sec, and infinite file space so all the current and past photos are always available. If you saw me taking your picture somewhere on the river it is likely to be found here. Realtime Web Based Rivergauge Project Page This was a 2 year home project that became operational in May 2003. 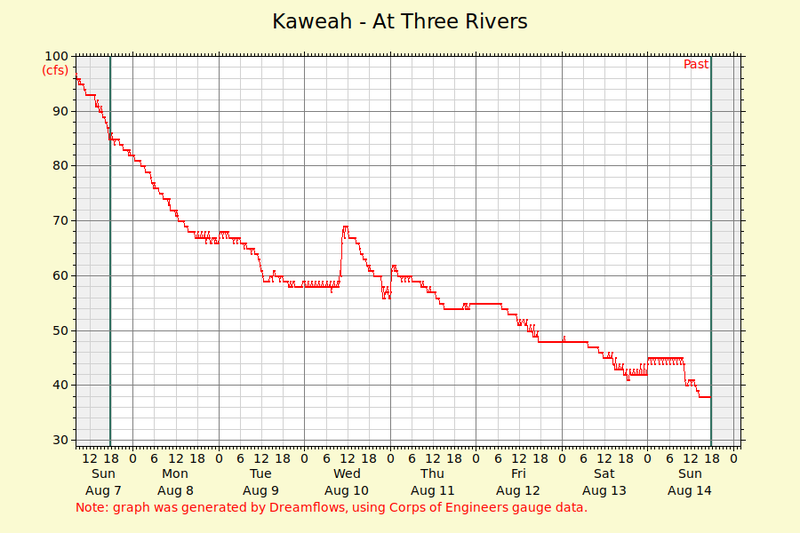 The Kaweah Rivergauge Page Also available as http://rivergauge.kaweahriver.org has the level and water temperature data and plots reported from the rivergauge. The riverguage will be in real-time operation again in May of 2010. More spring runoff infomation is moved Here. 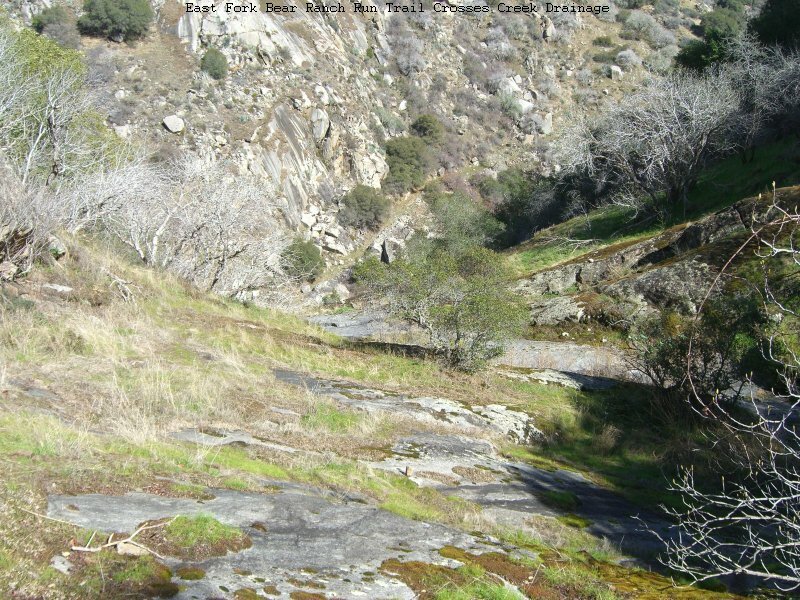 The Headwaters of the Kaweah (Expedition Boating) from Cliff Creek to Hospital Rock has been run in the spring of 2004. The Buckeye Flat Section (Class 5+) from above Buckeye Flat Campground to Hospital Rock adds a mile of difficult water to the Hospital Rock Run. 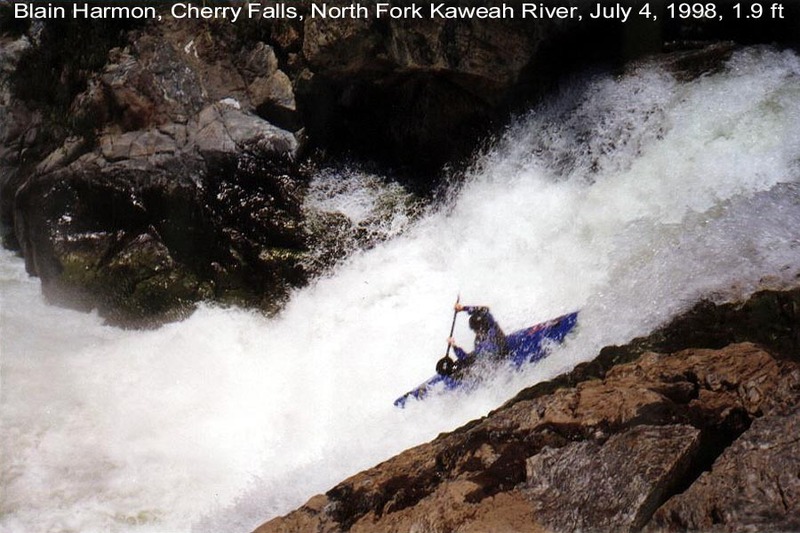 The Marble Fork (Class 5+) from 2.5 miles above the confluence with the Middle Fork was run in 2009 by Ben Stookesberry and Darin McQuoid. The Marble Fork (Class 5++) from the Crystal Cave Bridge through the Marble Falls Gorge was run in June 2012 by Ben Stookesberry and Chris Korbulic. The Upper Marble Fork (Class 5+) from the Generals Highway to Crystal Cave Bridge has been run. 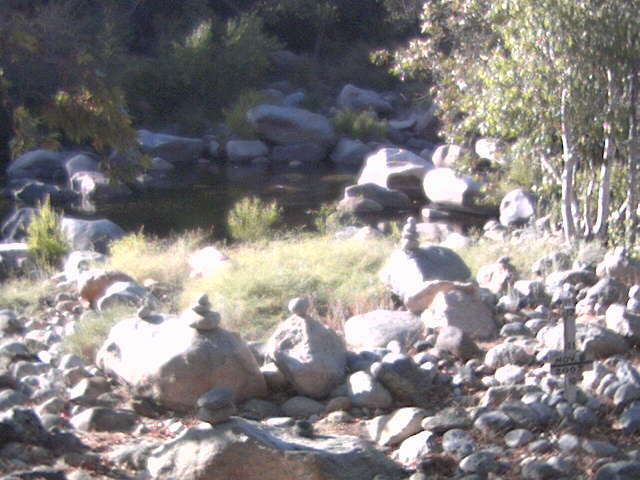 Dry Creek above the confluence with the Kaweah is unrun and only has enough water during a major rain storm. Probably runnable but with hazards. The St. Johns River below McKays Point (Class 2+) and across the Valley has been run. The Kaweah River (Irrigation Canal Boating) below McKays Point is yet unrun. 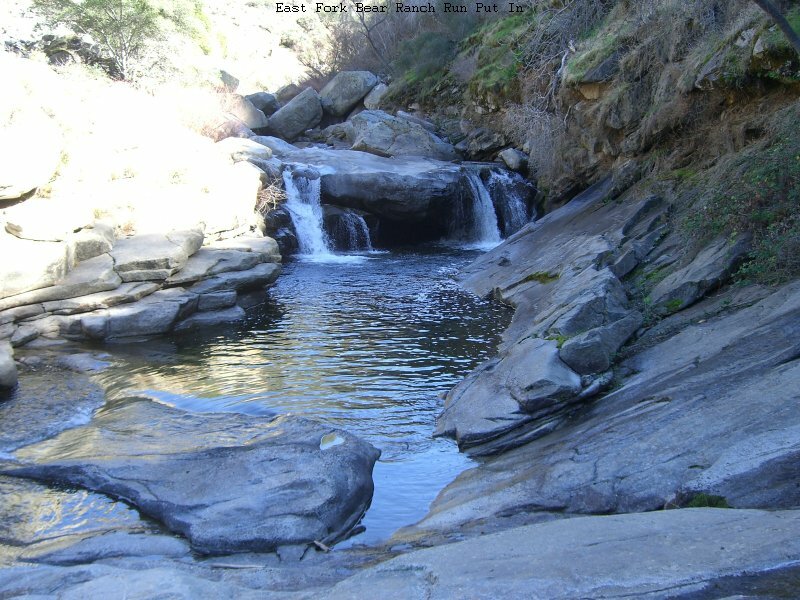 The Headwaters of the North Fork (Cherry Flat section) (Class 5+) starting 9 mile above Yucca Creek was run in July 2010 by Cody Howard et al. The headwaters of the East Fork from Mineral King Valley to the Atwell-Hockett trail crossing is unrun and is likely unrunnable. Picture of the Day Archive for the 2000 through 2006 boating seasons. 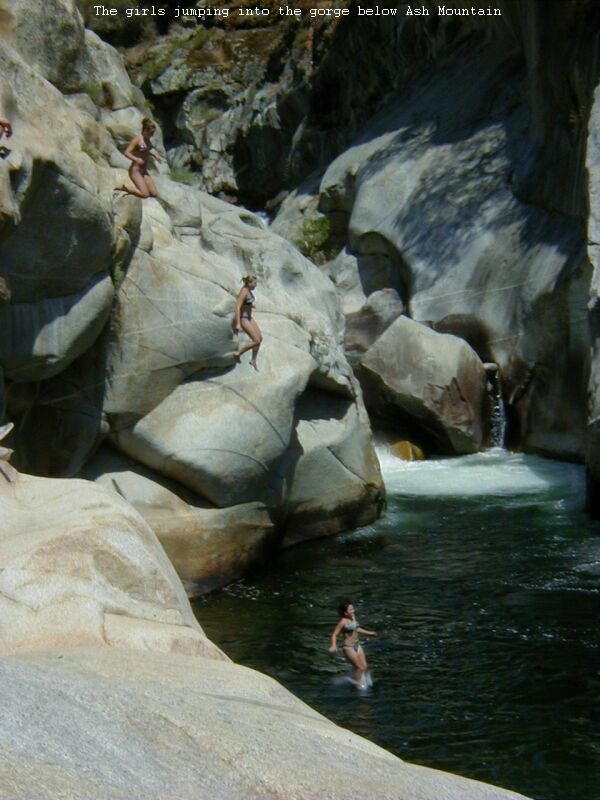 The Girls Cliff Jumping into the Gorge below Ash Mountain. The Three Rivers Hideaway, Formerly The Three Rivers Motel and RV Park is under new ownership and management. 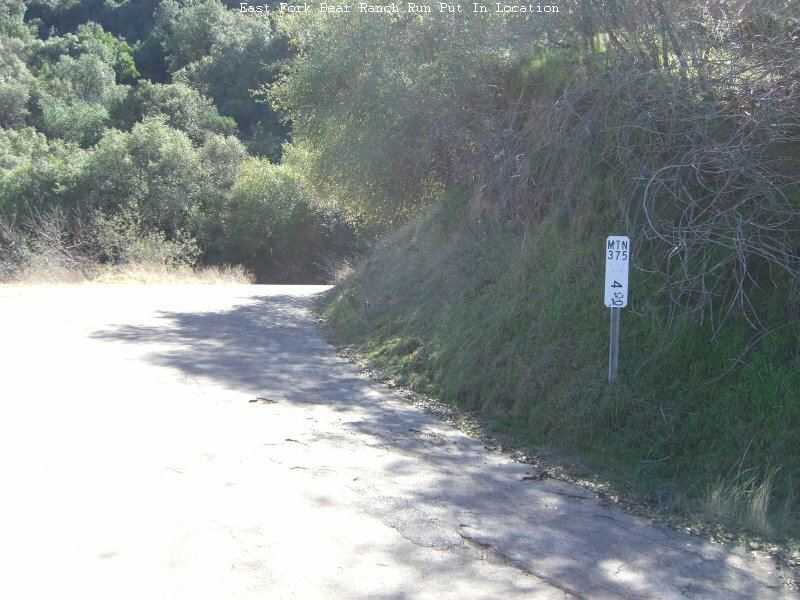 Located a quarter mile west of Dinely Bridge on Hwy 198 it offers accodations and camping. This facility is boater friendly and recommended by the KRP as THE boater camping spot! Dave Hammond has done an incredible job of really improving this facility over what existed with the former owners. Just across the street from the We Three Bakery where you can get the best boater breakfast in Three Rivers. Historic Flow Data for all Gauges in Tulare County, Calif.
A reprint of the trailworks.com article about the Kaweah as it appreared in December of 1999 on the trailworks.com website has been located. 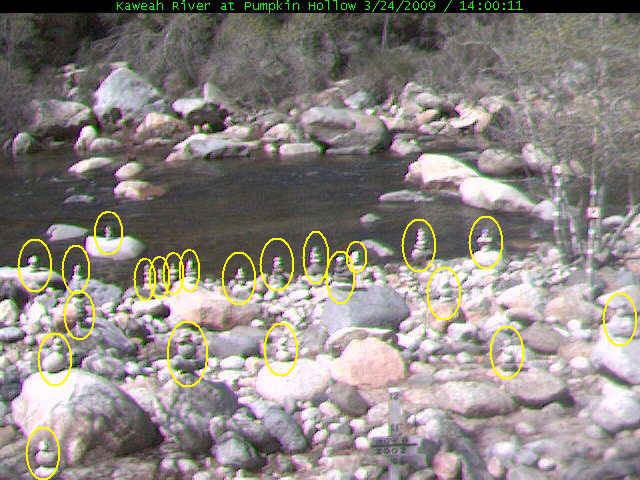 You can find it on the Kaweah River Pictures Page. 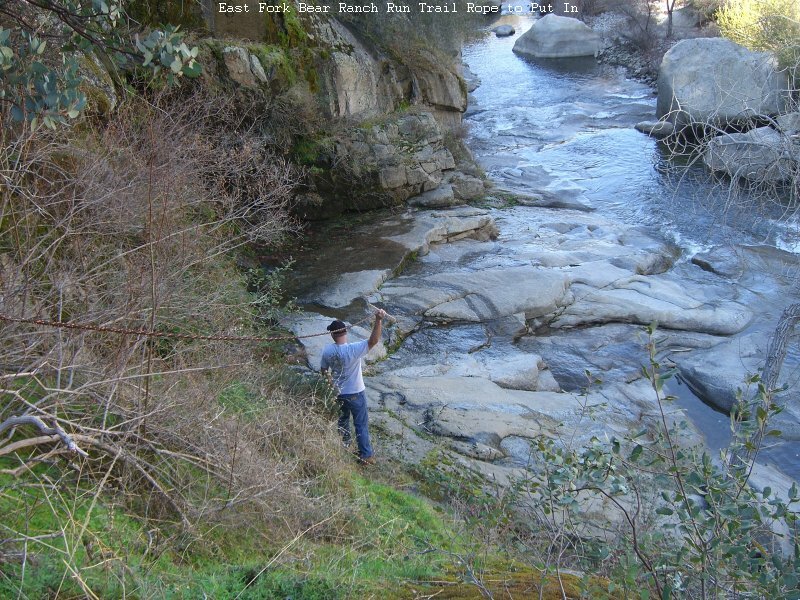 The Kaweah is difficut to access because all the land adjoining the river is privately owned. The traditional put-in at the river left upstream side of Pumpkin Hollow Bridge at the East Fork confulence was fenced off by the land owner in the spring of 1994 in cooperation with Cal Trans, the California State Highway Dept. The only reasonable access point for private boaters is 0.6 miles downstream of Pumpkin Hollow Bridge at the retaining wall where the highway comes immediately adjacent to the river. There is some parking downstream along the road. Dinely Bridge, has not been contested as an access point. The land on the right bank upstream of the bridge is owned by a public water district. Parking in Three Rivers is available at the School on the south side of Hwy 198 across from the Chevron Service Station. 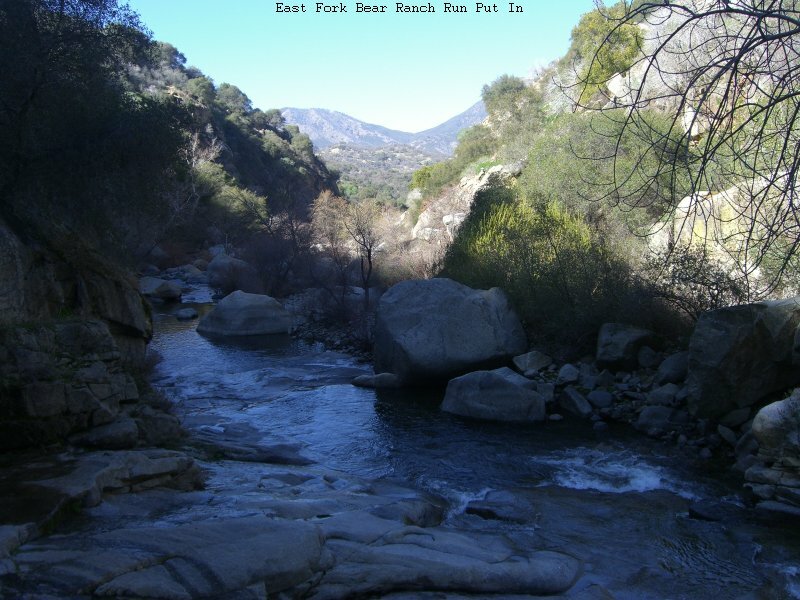 Click here for more on the Pumpkin Hollow Bridge Access situation or Click here for comprehesive general information on the politics of the ongoing Kaweah River Access issue. 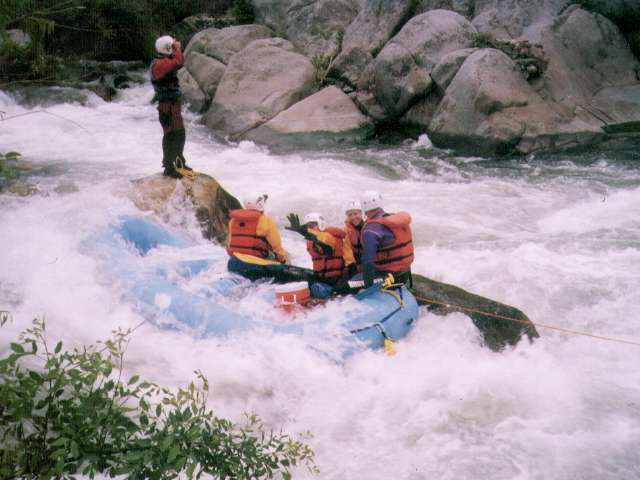 The Kaweah River Page, http://c2.com/kaweah/Copyright © 1996 through 2016 by Bill Pooley. All rights reserved. 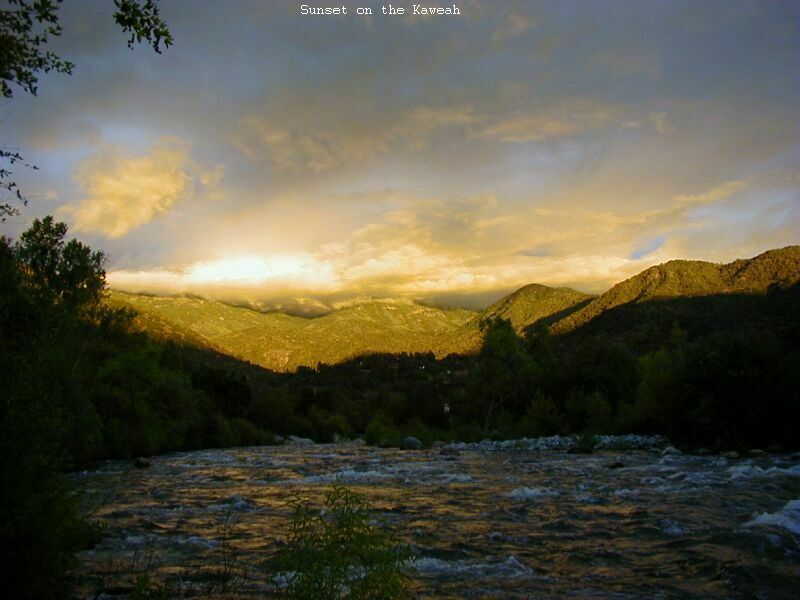 The Kaweah River Page is a non profit web site. The links to commercial operations have been freely donated as well as political endorsements. This web page is Y2K compliant and tediously edited by hand. It contains no browser corrupting, site slowing Java or Java script, cookies, annoying popup windows and only a rare occational banner ad. The main page is designed to work with a dialup connection. Only a simple html editor, Araneae, is used to highlight the html syntax during editing. Spelling and errors in grammar are par for the course, I'm an engineer for Heaven sakes, not an English teacher. This website is best viewed on a monitor with at least 768x1024 display size and 16 Million colors.